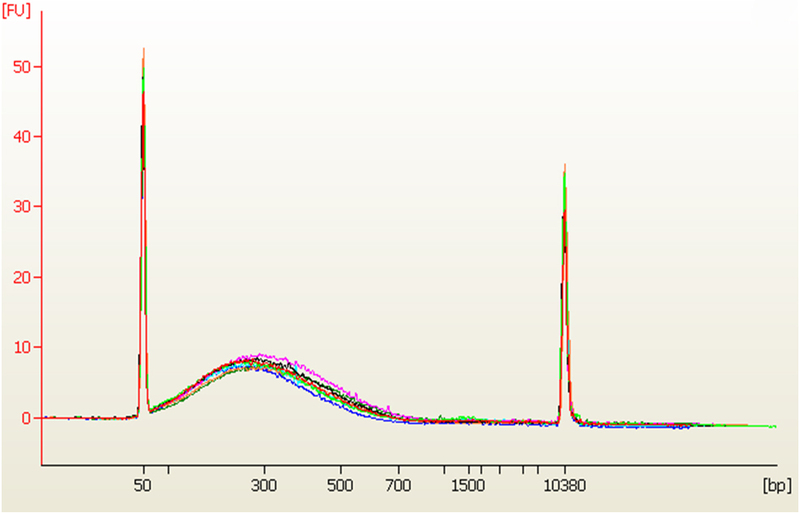 Demonstration of consistent fragments achieved with a single run of 12-sample multiplex shearing with the EpiSonic™ 2000. Setup of the EpiSonic™ 2000 Sonication System. 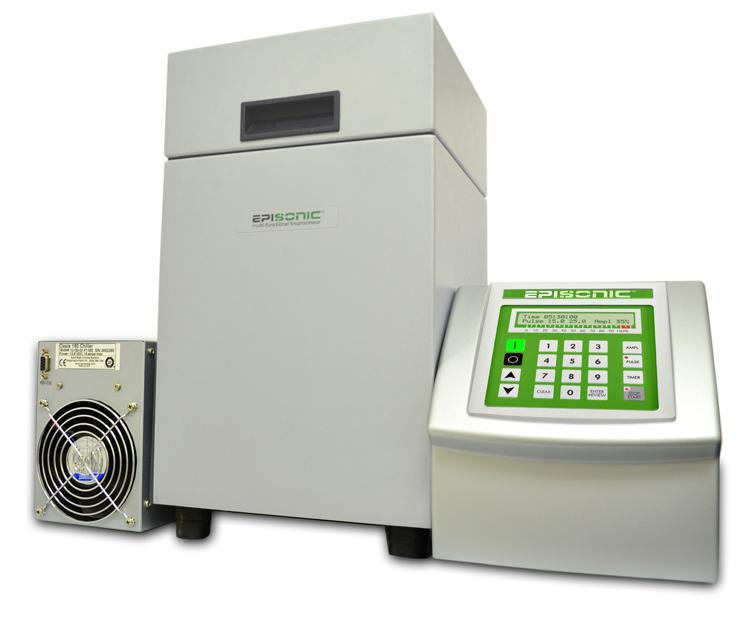 The EpiSonic™ 2000 Sonication System is the latest sonication-based instrument with integrated cooling for DNA shearing and chromatin shearing applications. This sonicator is designed for simultaneous, optimized processing of 1 to 12 samples at small microliter-level volumes (optimal at 15 µl of volume), making it an ideal solution for next-generation sequencing due to its high shearing consistency and uniformity. Generates fragments compatible with Illumina, Ion Torrent, 454, and Pacific Biosciences platforms. 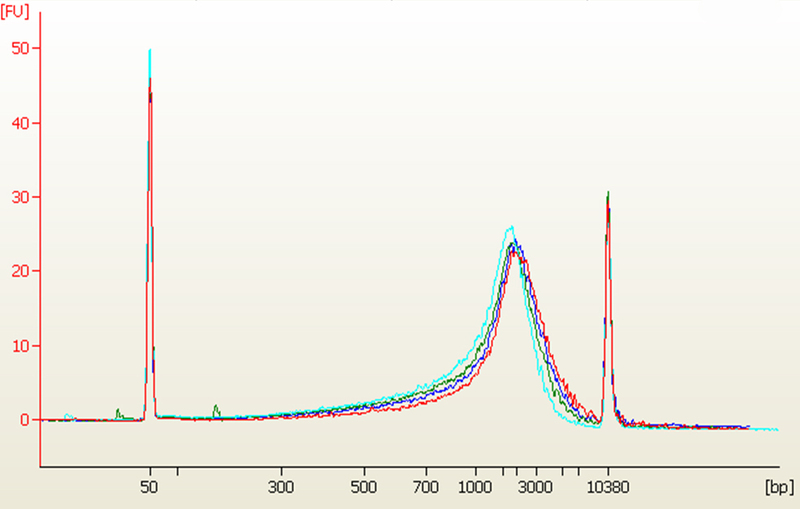 Generates tight and highly reproducible fragment distributions. Capable of achieving uniform fragment sizes between 150 bps and 20 kbs. Meets "the scientist's requirements" for a low-cost, flexible, higher throughput and easy-to-use design. Eliminates operator-induced variations, improves recovery yield, increases efficiency, and provides results that can be standardized. Fig. 2. 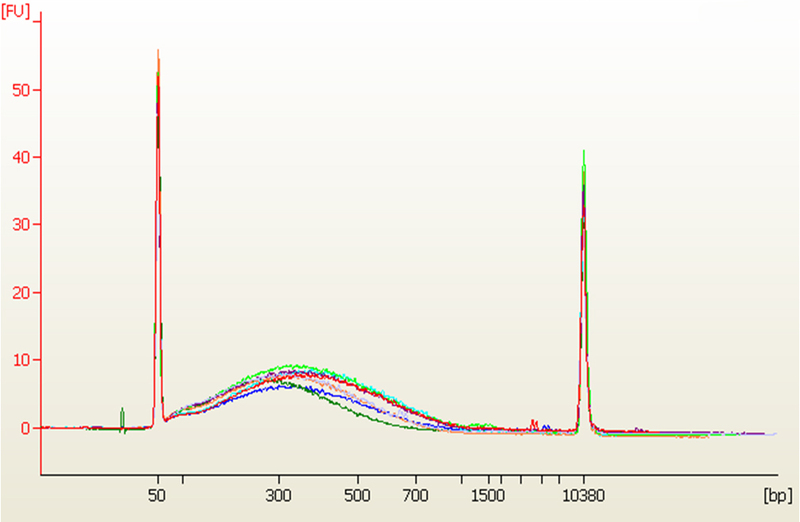 Demonstration of consistent fragments achieved with a single run of 12-sample multiplex shearing with the EpiSonic™ 2000. Fig. 1. Setup of the EpiSonic™ 2000 Sonication System. Ultrasonics, or ultrasound, literally means beyond sound -- sound above the human audible spectrum. Standard ultrasonic processors or sonicators operate at a nominal frequency of 20 kilohertz (kHz) or 20,000 cycles per second (cps). The automatic tuning feature of the EpiSonic 2000 actually moves the frequency within a small range during operation to optimize performance. The ultrasonic energy can then be converted by a pziezoelectric converter/transducer into acoustic energy to cause liquid cavitation through mechanical vibrations. Why does the EpiSonic operate at 20kHz? At lower range frequencies (20kHz to 100kHz), large cavitation bubbles are produced -- the collapse of which causes extreme hydraulic shearing forces and effects. Digitally Adaptive Sonocavitation™ (DAS), a 20kHz principle, allows for the size of the cavitation bubbles and the corresponding cavitation energy produced at low acoustic frequencies to be digitally controlled by dynamic amplitude adjustments of 1% to 100%. Therefore, DAS™ is more suitable for generating controllable shearing forces to break up cells and macromolecules such as DNA and chromatin in a non-contact, precise, and reproducible manner. What are the differences between the lower frequency Digitally Adaptive Sonocavitation (DAS) and higher frequency mechanisms for acoustic-based sonication? DAS™ operates at 20kHz to cater to users who desire flexibility in being able to powerfully shear samples at fast speeds as well as to precisely shear samples at slower speeds. In frequencies of levels higher than 20kHz (e.g., medium frequency range of 100kHz to 1000kHz such as Adaptive Focused Acoustics™ or AFA), there is less time for the cavitation bubbles to grow. This unfortunately results in smaller bubbles and a corresponding reduction in cavitation energy with increased wait times to effectively shear samples. 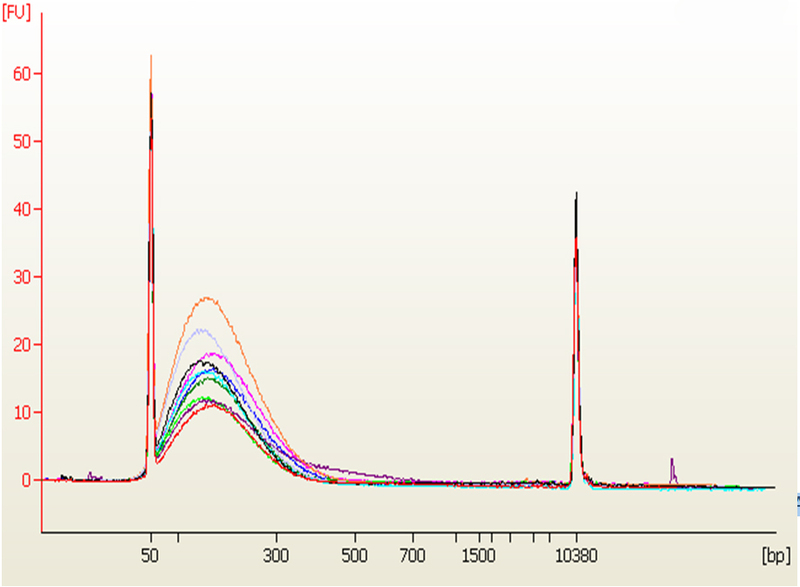 100kHz to 1000 kHz frequencies are instead better suited for submicron particle removal and often used for breaking up the structure of organic compounds such as chlorophenol, TBT, and MTBE. 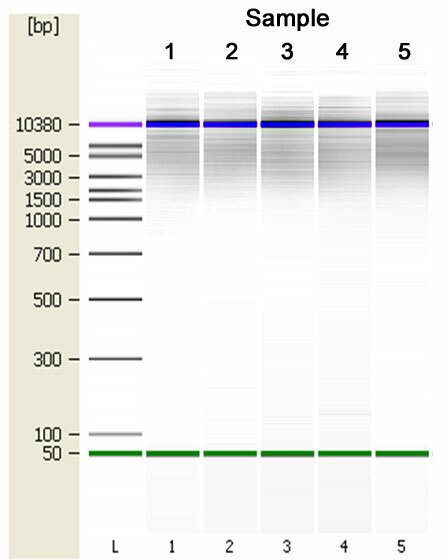 Higher frequency sonication does not generally hold any advantages over standard 20kHz frequency sonication for shearing DNA or chromatin. The DAS™ technology of the EpiSonic 2000 provides maximum versatility by combining the powerful shearing forces of 20kHz frequency with digitally precise amplitude controls to finely adjust the intensity of such forces. Can the EpiSonic be used with any other applications? Although the EpiSonic 2000 was specifically designed and supported for DNA shearing, chromatin shearing, and cell disruption/lysis, it is capable of disaggregation, homogenization, cleaning, mixing, degassing, dispersion, cleavage, catalyzing reactions, hydrolyzation, extraction, dissolution, emulsification, comminution, synthesis, microencapsulation. What kind of volume sizes can be used with the EpiSonic per sample? 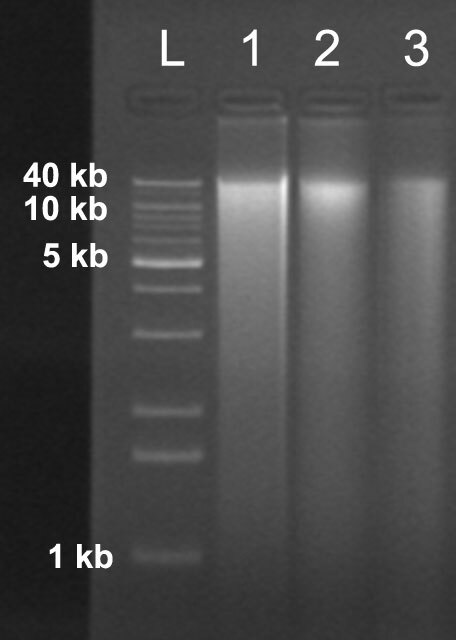 0.2 ug of DNA in 15 µl of volume is recommend per processing tube. Adaptive Focused Acoustics is a trademark of Covaris, Inc.
Zamudio R et. al. (March 2019). Phylogenetic analysis of resistance to ceftazidime/avibactam, ceftolozane/tazobactam and carbapenems in piperacillin/tazobactam-resistant Pseudomonas aeruginosa from cystic fibrosis patients. Int J Antimicrob Agents. Ludt WB et. al. (February 2019). Genomic, ecological, and morphological approaches to investigating species limits: A case study in modern taxonomy from Tropical Eastern Pacific surgeonfishes Ecol Evol. 2019:1-12. Gunn SR et. al. (February 2018). Reference size-matching, whole-genome amplification, and fluorescent labeling as a method for chromosomal microarray analysis of clinically actionable copy number alterations in formalin-fixed, paraffin-embedded tumor tissue. J Mol Diagn. Diallo K et. al. (May 2017). Hierarchical genomic analysis of carried and invasive serogroup A Neisseria meningitidis during the 2011 epidemic in Chad. BMC Genomics. 18(1):398. Johnson EC et. al. (October 2016). A small molecule targeting protein translation does not rescue spatial learning and memory deficits in the hAPP-J20 mouse model of Alzheimer's disease. PeerJ. 4:e2565. Schmidt K et. al. (September 2016). Identification of bacterial pathogens and antimicrobial resistance directly from clinical urines by nanopore-based metagenomic sequencing. J Antimicrob Chemother. Weyand NJ et. al. (September 2016). Isolation and characterization of Neisseria musculi sp. nov., from the wild house mouse. Int J Syst Evol Microbiol. 66(9):3585-3593. Mukherjee A et. al. (November 2015). HMGB1 interacts with XPA to facilitate the processing of DNA interstrand crosslinks in human cells. Nucleic Acids Res. Morris M et. al. (October 2015). Network dysfunction in α-synuclein transgenic mice and human Lewy body dementia Ann Clin Transl Neurol..
Xu X et. al. (June 2015). Hypoxia-induced miR-181b enhances angiogenesis of retinoblastoma cells by targeting PDCD10 and GATA6. Oncol Rep. 33(6):2789-96. Deasy AM et. al. (May 2015). Nasal Inoculation of the Commensal Neisseria lactamica Inhibits Carriage of Neisseria meningitidis by Young Adults: A Controlled Human Infection Study. Clin Infect Dis. 60(10):1512-20. Gheyara AL et. al. (July 2014). Tau reduction prevents disease in a mouse model of Dravet syndrome. Ann Neurol.